Elite Whey from Dymatize is a nutritional supplement that stimulates protein synthesis, promotes muscle development, helps in weight loss and improves recovery.It provides optimal proportions of proteins: whey protein concentrate and whey protein isolate, a perfect combination that allows a product with less fat and carbohydrates, with guaranteed results. 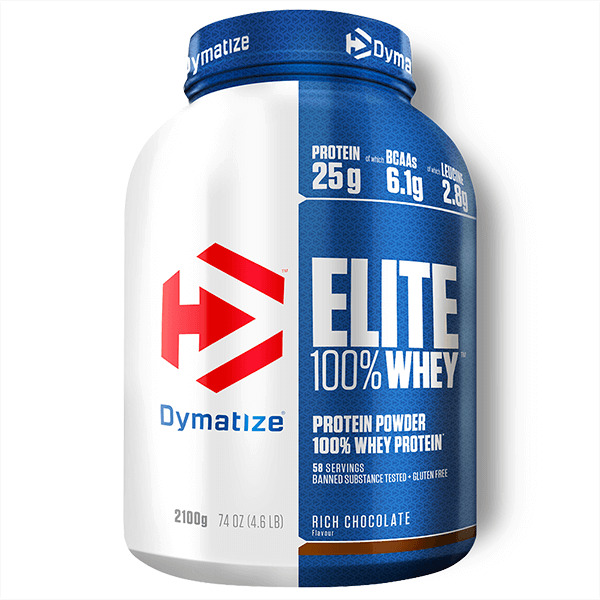 Elite Whey from Dymatize is a nutritional supplement that stimulates protein synthesis, promotes muscle development, helps in weight loss and improves recovery. With new delicious flavors. It provides optimal proportions of high quality proteins to maintain muscles and health, whey protein concentrate and whey protein isolate, a perfect combination that allows a product with less fat and carbohydrates. It contains whey protein concentrate and isolate of high quality, it is high in BCAAs and glutamic acid, it is a glutamine precursor. With very little fat, no sugar, no aspartame and Zytrix® digestive enzymes to enhance its bioavailability. Elite Whey from Dymatize consists of whey protein concentrate and whey protein isolate. This combination results in a product with lower fat and carbohydrates. The whey protein provides the essential and branched amino acids needed for muscle development and recovery after training. This protein has a fast absorption and easy digestion, which is substantially improved with digestive enzymes. It contains no added sugars. It provides a low sugar content naturally (1 gram per dose). Recommended for athletes who wish to develop the muscles and speed recovery and active people who want to improve their muscle composition and protect the musculature. Elite Whey from Dymatize is a high quality nutritional supplement that promotes muscle development and improves recovery, now available in new delicious ways, such as Cookies & Cream and Cinnamon Bun, along with the classics provide a variety of flavors to choose from: Gourmet Vanilla, Vanilla cupcake, Rich Chocolate, Chocolate Fudge, Chocolate Mint, Strawberry Blast, Smooth Banana, Chocolate Cake Batter, Cafe Mocha, Pina Colada, Butter cream Tofee Mix and Neopolitan. This nutritional supplement has the greatest safety and quality offered by Dymatize company, founded in 1994 and leader in the industry, with products in more than 50 countries. All Dymatize products have the seal Free of banned substances and Quality verified that guarantees the results detailed in the product information. Classic but so good . Good value for money. Great flavour.